Official languages of the RIPESS Global Forum 2013: English, French, and Spanish. A formal moment of the meeting, which can be open to external public, with some speakers among the RIPESS Board (one for each Continent), the Local Organizers Committee, Government authorities, Supporters, Partners. The timeline of the Global Forums should briefly be recovered, highlighting the main results of each one, in a manner to contextualize the actual 2013 Global Forum. This is the moment of a global analysis where the world’s situation, the global crisis and the actual challenges and the possible role of SSE in the world would be treated. This will be done in the Plenary with a Ripess Board member and one or two key speakers not necessarily directly involved with SSE. Someone from UN could also be called to contribute in this moment with the challenges on global governance and the redefinition of the Millennium Goals in 2015. Results of the UNRISD Conference “Social and Solidarity Economy: Potential and Limits” could be a good input for the discussions. The results of the World Social Forum on SSE (July 2013 in Brazil) and the World Forum on Fair Trade (April 2013 in Brazil) could also be briefly presented. Each Continent will have members from RIPESS Board who will present a State of the Art of SSE in their respective continents. The continental SSE state of the art should provide an overview of social & solidarity economy initiatives and the movement in each the 6 continents: Africa, Asia, Latin America & the Caribbean, Europe, North America, and Oceania. At this point, each continental representative will also present briefly the main results of the proposals from the Continent about the Global Vision on SSE. On the second day, the Global Forum will take place in an open space, defining a “Territory of Social Solidarity Economy”. The probable place will be the Quezon City Memorial Circle Memorial Circle,in collaboration with the QC city government. In this way, foreign and local participants can either display their products or advocacy materials. Local SSE enterprises will also be invited to present to the Forum participants their concrete practices in The Philippines, as a way to present concretely something about the reality of SSE in Asia. This will provide Forum participants and local community the opportunity to know something about the diversity of SSE in the World, engage the exhibitors in a dialogue and provide economic exchanges among the international actors that are present and also by institutional consumers from Asia, which are going to be contacted beforehand with a catalog of the products and services that are going to be available in the Fair. With the objective of deepening the discussions and producing resolutions that will guide the RIPESS members in the next 4 years, the participants will focus on 4 themes during the day: “Global Vision ”, “SSE Experiences and Economic Integration”, “Global Networking ” and “Communication and visibility of SSE ”. The methodological approach for this moment is to base the discussions on real and territorial based experiences in the 5 continents and have a very participative and democratic way to build its resolutions. In the morning, all forum participants will be involved in crafting a Global Vision of SSE. This Theme debates the basic principles that define SSE world-wide, and will serve as reference for Ripess’ comprehension of SSE. Both viewpoints that are consensual or divergent (i.e. showing different perspectives on SSE) should be highlighted. The idea is that a basic document developed by the continental networks during the year could serve as a reference for debate, besides the concrete initiatives that will be discussed in the workgroups. Prior to the Forum, the continental networks of RIPESS will initiate discussions on the global vision of SSE. Formulations of the global SSE vision will then be gathered and submitted to the respective RIPESS Board members, who in turn will review the vision formulations. RIPESS Board members will then select what may be deemed as sound formulations of the global SSE vision and submit these to the Executive Coordinator of RIPESS. 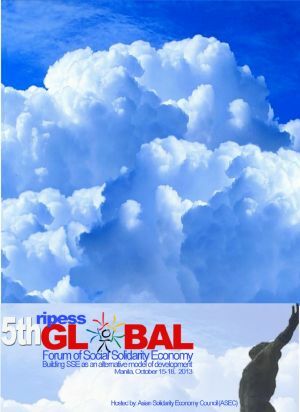 The RIPESS Global Forum 2013 participants will collectively review all the submissions and select what they may deem as the best or most appropriate formulation of the global SSE vision. In the afternoon, the Forum participants will be divided into three workgroups which will treat the remaining three themes: 2) SSE Experiences in the Territories; 3) Global Networking and Organizing; and 4) Communication and Visibility of SSE. This group will be focused on the ways that the existing initiatives of SSE do their economic activities and their integration in economic networks and supply-chains. In this Theme, territoriality and sustainable development is a key aspect that should be present transversally in the discussions. Global Networking refers to the way that the movement organizes itself locally, nationally and internationally. This has to do with political strategies, articulation with other movements and international institutions, and the structure of the different networks that are more effective in building up a strong and interconnected global network of SSE represented by Ripess. Theme 4: Communication and visibility of SSE One of the main challenges of SSE is its invisibility towards the common public, the public policy makers, and even in other social movements. This Theme will treat this challenge and propose ways to spread the message and contributions of SSE for another development model. In each one of the three thematic workgroups, each continent will have chosen, before the Forum, one concrete initiative that will be presented in each Theme. This means that for each thematic workshop, there will be at least 5 persons (one from each continent) who will share their perspective on the theme based on their concrete experience and practice. Therefore the continental experience will serve as the starting point of the discussions (bottom-up approach). The presenters should have prepared their presentations well ahead in time for translation into other official languages of the RIPESS global forum. Each Thematic Group will be coordinated by two RIPESS Board members, preferably one Man and one Woman, from different Continents. Finally, a Systematization Committee will work on the final proposals developed by the 3 Thematic Groups to have them ready for the Continental Meetings and Final Plenary the next day. During the evening of the third day, the participants of each Continent will have a separate meeting at the same time (5 rooms). It’s a moment to build their evaluation of the discussions so far and to prepare the continental proposals and presentation in the next day. Since there were already Continental Meetings prior to the RIPESS Global Forum 2013, the results of such Continental Meetings will also serve as reference to be considered by the participants. The Final Plenary is the moment where the main results of the 4 days are presented: The state of the art of SSE in the 5 continents; The issues raised in the “SSE Territory” during the second day; The results and proposals of the 4 Themes; and the planned activities and commitments of the 5 continents. It could be closed with an open microphone where people could freely do an evaluation of the Meeting, share commitments from their organization and contribute with other reflections on the results that were presented. The Closing Ceremony could be a moment to show the richness of the different ways that SSE is lived in the 5 continents: with music, colors, testimonies. Participants could for example be advised to bring a national costume to be worn and prepare a cultural presentation, in music, dance, or poetry.